The festivities are over... the champagne popped, the tree ornaments packed away till next year. After all that hustling, a little down time is in order. On these cold winter nights, in my mind, nothing is better than to curl up on the couch with a bowl of popcorn and a glass of wine and read a good book or watch a movie. 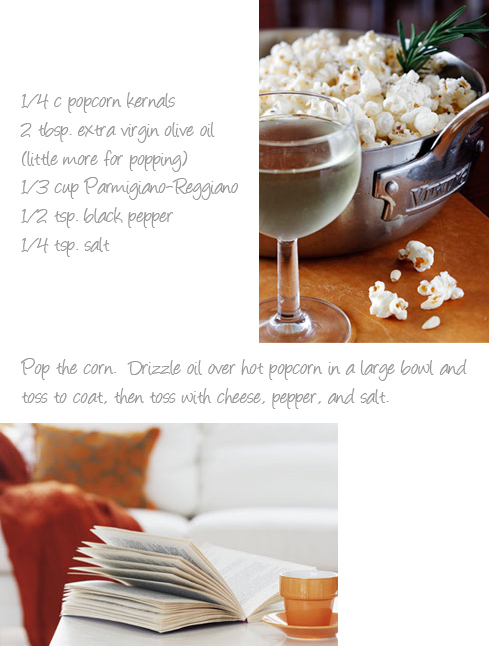 I want to share with you my favorite popcorn recipe. It is not only easy and delicious, but it's a healthy twist for all of us whose New Year's resolutions include shedding a few pounds. I know your probably a bit skeptical... and I too consider myself a popcorn purist (I do love the buttery goodness)... but I swear this has so much great flavor you won't miss it. For those of you who may want the numbers: 1/3 cup of Parmigiano-Reggianno is 110 calories and has 8 grams of fat, compared to 303 calories and 34.6 grams of fat in just 3 tablespoons of butter. Can't wait to curl up with The Girl with the Dragon Tatoo, am I the only who hasn't read this yet?